It’s a sad week in the world. On Wednesday, my Texas family came together for the funeral of my cousin, Maureen, who was only 50. She’s the first of my generation to die, and even though she struggled with health problems for most of her adult life, it’s still a shock. Living half way around the world, I find it hard to experience these things without the comfort of family nearby. I called my Dad, had a bit of a cry and felt better after hearing his voice. But that’s about all I could do. Over here you don’t have the chance to mourn together, to attend the funeral, go out for a meal after and remember all the good things about the person you’ve just lost. These are just the parts of life you miss out on when you’re an expat. 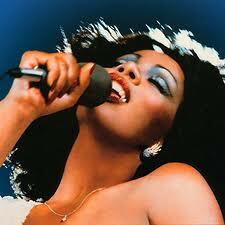 Now today I read the news of Donna Summer’s passing, from cancer, at age 63. The famous Francesco Scavullo portrait from her Live And More album. I think back to Maureen, who was on the dance team and sang in the choir in high school. I’ll bet she danced to some Donna back then. We lived near her and her family, and as one of my older cousins – with a very sarcastic sense of humor and a busy social life – she was immensely cool to me. In a late seventies, feathered hair kind of way. After college, she returned to San Antonio, got married and had a daughter. Over the years, her Catholic faith grew even stronger and she devoted much of her life working for and supporting the Church. Just as Donna Summer turned to God and gospel after the heyday of disco, Maureen sowed her wild oats and then built a life around her faith. You can read a bit more about her by clicking here. If you can ever call someone ‘Queen of’ (Soul, Rock, etc), it would have to be Summer – the undisputed Queen of Disco. Starting with 1975’s “Love to Love You Baby”, Summer and her producers created an entire new disco sound, leading the way on the dance floors and influencing decades of club and techno music. Today you can hear the breathy melody of “I Feel Love” in a commercial for Gucci’s Flora perfume while ‘Love to Love You Baby’ has been sampled by Beyonce, Timbaland and LL Cool J. Not to mention the numerous movies that have used her music: Priscilla, Queen of the Desert, The Full Monty, etc. Summer’s biggest year for hit singles was 1978 – when I was the same age that EO is now – when she had four Number One hits: “MacArthur Park”, “Hot Stuff”, “Bad Girls” and “No More Tears (Enough is Enough)” – a duet with Barbra Streisand. How many times did I listen to On The Radio, her Greatest Hits double album? Too many to count. On my little Radioshack turntable, with headphones, singing loudly without realizing I was annoying the rest of the house. Between that and the Grease soundtrack you basically had the sound of slumber parties for the whole of my middle school years. At the same time that I was singing badly to Donna, newly divorced parents (my Mom included) were hitting Burgundy Woods (God I love that name) to dance to her disco hits. Burgundy Woods – the big disco in our part of town – was a compelling, mysterious place, right off the access road on Loop 410. By day its grey-brown facade and huge parking lot hinted at nothing special, but at night I imagined it to be full of beautiful strangers, moving across the lighted dance floor and doing lots of other things – stuff that I wasn’t quite sure of. Coke was still cola to me after all. So now I’m sitting here listening to Donna’s greatest hits, trying to decide what’s my favorite song. I downloaded a bunch of her stuff several years ago and have found it to be fantastic music to ride the subway with. The sensuous techno pulse of “I Feel Love” goes perfectly with the metal anonymity and churning wheels of a train ride. There is also one song I’ve fallen in love with – her cover of Barry Manilow’s “Could It Be Magic”. I know, it sounds naff, but it really is an amazing version.